Today is my birthday, and I am celebrating as I usually do by getting all sentimental and stuff. Oh, and watching Friday the 13th after the kids go to bed. When I was a little girl we went to the library all the time. We didn't own very many kids books, because we could borrow then anytime. Oh how I miss libraries with English books! 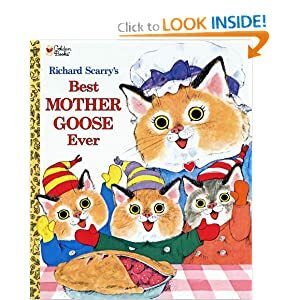 One of the few books we owned was Richard Scarry's Best Mother Goose Ever (CAN, JP, US). It is a Golden Book, so the one I had as a kid had the iconic gold and black binding. This was the first book I bought for my son, but this one is yellow on the binding. I can't say that wasn't a disappointment. The contents are just the same (minus spilled apple juice, ripped pages, and places my brother licked it). 92 pages of familiar and not-so-familiar nursery rhymes. When was the last time you heard this one? Scarry's signature anthropomorphic figures often tell a big story behind the verse, and my kids love wondering if the animals in one are related to another. My favourites are all related to pigs. This is the illustration I love the most, the wrinkles on those kissing snouts! My favourite verse, as well as my kids', is This Little Pig. I made my dad recite it while pulling on my toes until I was ridiculously big. My kids both demand I do it every night as well, so this book gets an awful lot of use. It's lovely to curl up in bed with my littles just like my dad with me, passing on the exact same verses. I also love that I know how good rhyming is for their language development, despite the archaic grammar it gives them a mental workout that nothing else rivals in the preschool set. Do you have a favourite book of poems or nursery rhymes suitable for kids? Yes! The gold and black binding! My mother saved a lot of these, actually, and I read them now with my kids. You sound like you've led (and are leading) a very adventurous life! I love that the book is confident in its own awesomeness. I don't remember the name but when I was little we had a big orange book of nursery rhymes with older (30s/40s) maybe style illustrations that I loved. I hoped my mum might still have it in a box somewhere as almost everything else is still around but she thinks it fell apart from being "loved" too much. I'll just need to find one to make memories for Little S! happy belated birthday! Ahh, this looks so wonderful :-) Richard Scarry is always a winner. We love his picture dictionary a lot too. Although not technically Mother Goose, a rhyme book my kids really love (I found it in a second hand book last summer) is this one http://www.amazon.com/Cakes-Custard-Childrens-Brian-Alderson/dp/0688220509 Helen Oxenbury's illustrations are lovely. Thanks for the review. I'll have to pick that one up from the library! We've just been using the Mother Goose board book the BC provincial govt gave to us for free when our little one was born (when the nurse came for a home visit). They also gave us a suggested reading list until pre-school age. High taxes here but free books! Oh yeah... we have a tonne of other books but no poems or rhymes. Gotta pick up the slack!